The back-row forward is off after the 2019 World Cup. 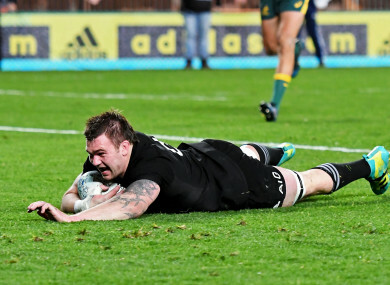 Liam Squire scores for the All Blacks against Australia. ALL BLACKS AND Highlanders loose forward Liam Squire will leave New Zealand at the end of the season to join Japanese club NTT Docomo Red Hurricanes. Squire has played 23 Tests for New Zealand and has agreed to a two-year deal in Japan. The 27-year-old, a veteran of 44 Super Rugby games, said he was keen to leave the Highlanders on the back of a successful season. “It seems like the right time to go. I have really loved my time in New Zealand with the Tasman Mako and in particular down here with the Highlanders,” Squire said in a statement on Monday. Squire made his Test debut against Wales in June 2016 and quickly established himself as a regular for the world champions. All Blacks head coach Steve Hansen is excited by what Squire will bring to his team in 2019, particular with the Rugby World Cup starting in September. “Liam has grown into an outstanding rugby player since coming into the All Blacks in 2016 and we again look forward to seeing how he goes this year,” he said. “His physicality, pace and skills are a real point of difference and he’s a really well-rounded player. Email “Liam Squire leaving New Zealand to join Red Hurricanes”. Feedback on “Liam Squire leaving New Zealand to join Red Hurricanes”.